Last month Microsoft released the SharePoint mobile app for iOS. Since more of our clients require mobile SharePoint solutions, I thought I'd try the app out and give my assessment. Let’s start with the very beginning. It’s a very good place to start. When you launch the app for the first time you're prompted which SharePoint environment do you want to sign in to. 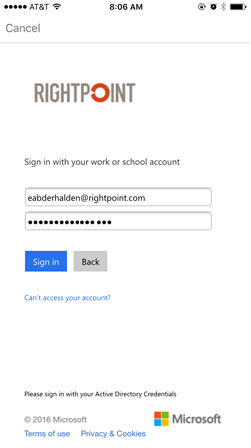 For SharePoint Online, you need to enter your email and password. When signing in to an on-premise server, you need to enter the URL and then your credentials. I didn't need to enter my domain, but I'm curious if you have multiple domains using your site if you would need to prefix your credentials with the domain then. Once you log in, you are not logged into the environment forever with that account. You can easily add more accounts and/or environments. Once you've logged into the app, you'll see that it is broken up into four tabs on the bottom of the screen: Sites, Links, People, and Settings. I'll dive into each of these sections. Sites is the first tab that loads when you sign into the app. Within this tab, SharePoint sites are broken into two categories: frequent and following. As you can see in the screen below, I have a bunch of sites within the tenant I’m signed in to, that I visit frequently. Pardon the funky formatting in the screenshot above as I had to obfuscate some of the site names. If you don't follow any sites, go ahead and start following them. I was impressed that after I started following a few sites, I was refreshed the Following page in the app and the new sites I just started following appeared within a minute or so. The million-dollar question, and the reason you're probably reading this blog, is how does SharePoint look in the app? Your results may vary. In their blog announcing the app, Microsoft said that "if you have invested in responsive, mobile-designed portals, they will shine through in the app." This is true. Some sites look gorgeous; other times, you'll be wishing you were not on your phone. Let me show you what I mean. Here's an Office365 Video portal. Based on my tests and Microsoft's statements, all video portals will look like this and I think that's great. Granted, O365 video portals are not typical SharePoint sites - but they're not the exception to looking gorgeous. I went to a team site and was really pleased with how easy it is to get around. The ribbon is nicely tucked up at the top of the screen and isn't log-jammed with icons. Here's a screenshot of the contents in a document library. You can click the search icon to open a search modal, add folders and links, upload, share, set alerts. I'm loving those tiles. If you're not a fan of the tiles, you can switch back to the list view. 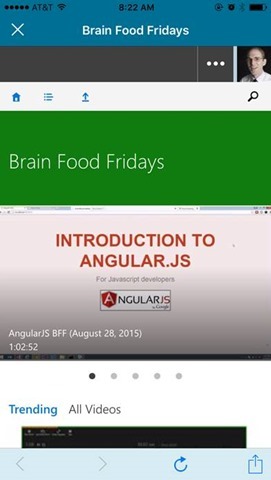 And if you're not a fan of big, easy to use tiles you can switch back to "classic" SharePoint. 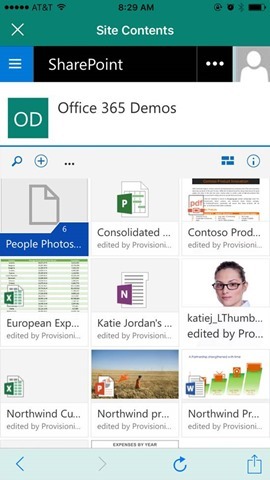 Your experience in a document library will vary depending if you have all of the Office apps installed on your phone. If you do, the files will open and can be edited in their respective apps. If not, you can only open a read-only version of the file. More on the integrations with the other apps later. When you visit a publishing site, or a site that has been customized, that's where the trouble starts. Here's a custom site we use internally for projects. Note the tiny ribbon especially compared to the previous screen shot. Even an infant's fingers would have a hard time selecting the gear icon to get to site contents. But when you do get to site contents, things change to be mobile friendly. In this case it's due to the fact that on this site we do not use a custom master page. But then once you get into a library, you're back to the same experience. The pain is not just for heavily customized sites. Here's a document library on an out of the box publishing site using the Seattle master page. I'm calling this problem "The SharePoint Branding Dilemma." This isn't terribly new. The question shouldn't be whether to brand or not. The question is really how much branding do you want to implement to meet your requirements? 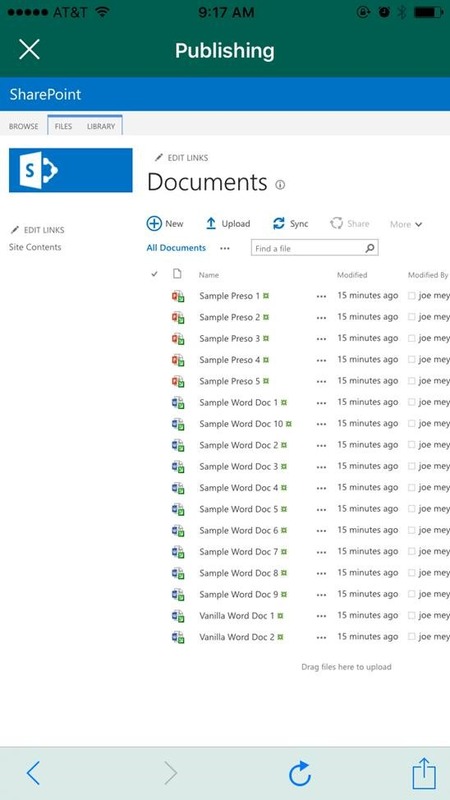 I think after years of hearing, "we like SharePoint but don't like how it looks", Microsoft is taking the lead by implementing the modern UI for Site Contents and document libraries. Since other updates, both major or minor, are pushed to SharePoint Online and can break branding, you should do your best to try and future proof your sites. There's a lot of development frameworks out there and provisioning engines like PnP can be utilized to deploy branding in non-invasive ways. There isn't a silver bullet to solve this problem, and this conversation might best be served in another blog, but if you're interested in utilizing the SharePoint app in your organization you should start thinking about the best way to implement branding for you. Links contain important links to content both within and outside of SharePoint. Where do these links come from? Good question. Technically here, but more specifically the links actually link in a hidden list at the root site collection in your tenant. 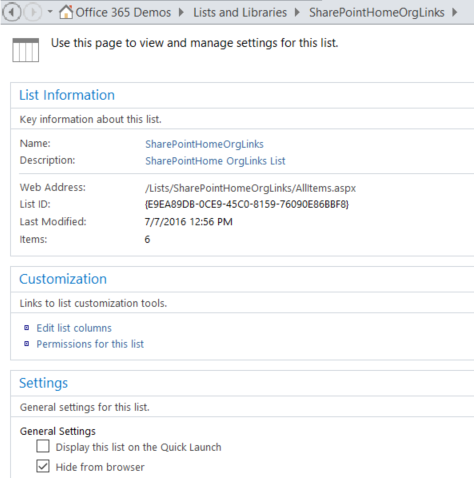 If you go to https://tenant.sharepoint.com and view site contents you can't find the list. Instead open up the that same site in SharePoint Designer. Click All Files> Lists. You want to select SharePointHomeOrgLinks. This is a new list to me, and a Google search seems to indicate it's pretty obscure as I only get one result. Why this list is hidden is beyond me, as I think admins would like the ability to easily manage these links. Also it's a little perplexing why it's on the root of the tenant. However if you're updating this list, tread lightly if you're thinking of making any other updates to the root of the site collection as problems have been noted here. The people tab shows you individuals you collaborate with. 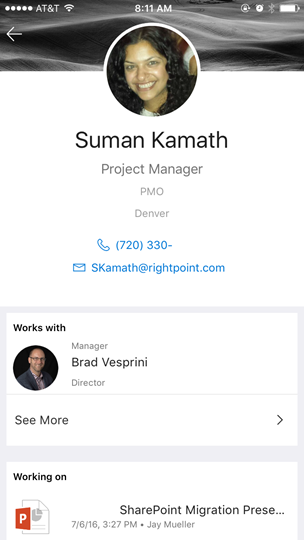 Selecting a user takes you to a mobile friendly version of their Delve page where you can see contact information, as well as their manager, and files they're working on. I had two different experiences with the people tab. In a SharePoint Online environment, the people tab was populated with people I email and IM frequently. 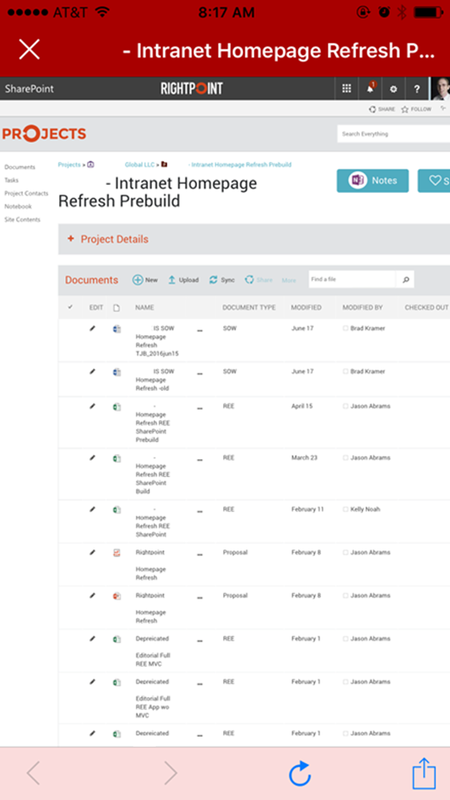 In a 2013 on-premise environment, the people tab was populated with my org chart. I believe it's because the on-premise environment does not have the power that is Delve and the Microsoft Graph API. The experience is a little disappointing when you visit your own profile as you can only view it, not edit it. This would be really nice to have. The settings tab is self-explanatory. At the present moment, I have about a half dozen Office 365 environments plus one on-premise environment. I can easily add all of these environments to the app. I just toggle my account through Settings. If content is king in a digital workspace, then search is queen. The SharePoint app has pretty good search functionality. You can search sites, files, and people simultaneously. You cannot filter, but the results do come with some recommended results. 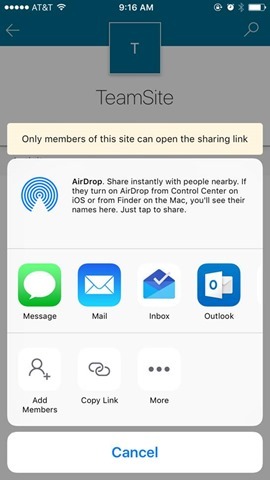 Another feature I like is the Sharing capability. 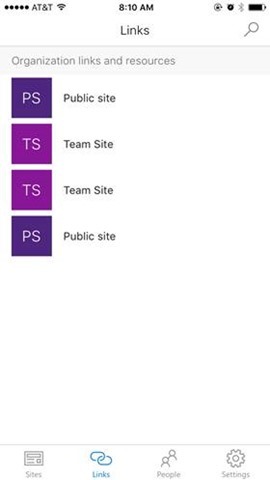 If this is really geared towards having pure mobile SharePoint use, adding users via the app is a clutch feature. Through this you can add users and groups to be members of a site. Does it Play Nice with Other Apps? If you have other Office apps installed on your phone, you can essentially perform all of your work tasks from your phone without needing a computer. The problem with this though is you need to install a slew of additional apps. 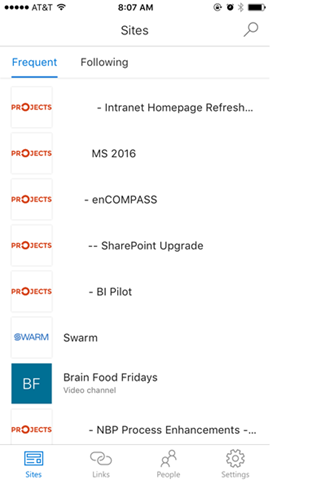 The SharePoint app works best with OneDrive, Word, PowerPoint et al. However, this is where the SharePoint app really falters. 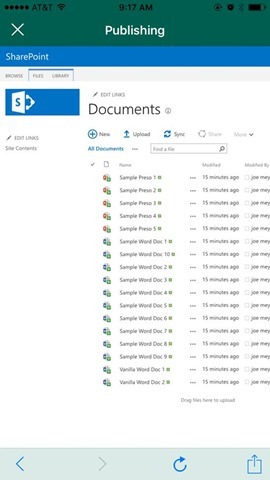 If you're in the SharePoint app and want to work on a document in a document library, you need to open the OneDrive app, and then from there open the appropriate Office app. I did all of this using iOS and since there's only a single button on the device, you quickly find yourself juggling a few apps. In many ways it's not terribly different than working at a traditional computer where you have a browser and a fat-client application running. But it's not particularly elegant. My fingers started getting fatigued from entering my credentials in each app when I changed tenants. It'd be amazing if somehow they could pass credentials from one app too the other. Overall the app is a start in the right direction. I like the search capabilities, effortlessly toggling between multiple tenants and environments is easier in the app than in the browser. The SharePoint sites look great and shiny when you have new, barely touched SharePoint sites. The main problem, and it's not the app's, is that customized SharePoint sites that are not optimized to be responsive don't look so hot. Because of this, there's no unified user experience with SharePoint in the app. As I touched on earlier, Microsoft is making progress in regard to this but the change will need to start at the site collection level. In some ways the app is unnecessary. We already have the OneDrive app which allows rapid access to files, search, the ability to jump between SharePoint Online tenants, the ability to open SharePoint sites in the app, as well as the ability to work offline. 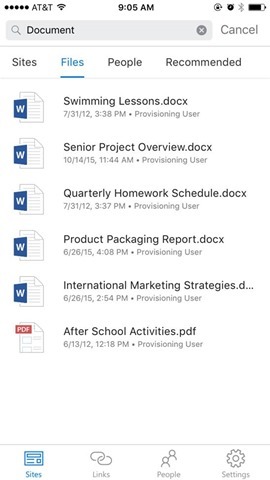 All that's missing in OneDrive is people search, links, and sharing capabilities. It would be nice if Microsoft could bake more of OneDrive into SharePoint or vice-versa to help eliminate redundancies in functionalities across the Office ecosystem of mobile apps. Plus on mobile devices that are perpetually crunched for space, I’d like to do more with less apps instead of installing more apps. To some, this app may feel like too little too late. That's a cynical belief and it's incorrect. 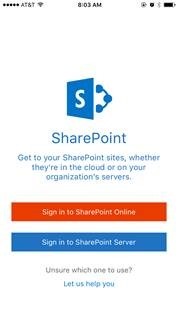 The SharePoint app can’t do everything it’s competitors do and it’s unrealistic to think that on first launch it would knock all of the functionality out of the park. I think the app is a great first effort to bring key SharePoint functionality to mobile users without significant development efforts. After hearing "mobile first, cloud first" over the last few years, the app - as well as recent changes by Microsoft to the platform - really hit home the point that the mobile experience is going to be instrumental to the future of the platform. I look forward to seeing how Microsoft’s mobile ecosystem for digital workspaces develops and matures in the near future.